Snow Grateful [G1910] - $6.00 : Yarn Tree, Your wholesale source for cross stitch supplies. 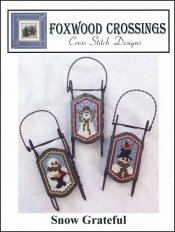 Cross stitch pattern by Foxwood Crossings. Three snowman ornament designs. Stitch count for each ornament is 17 x 31. Mount your finished piece onto #8423 Little Sled Ornaments.